To browse the web I usually use Chrome and so I often have several open windows with a lot of tabs open at the same time. I use different windows to sort my tabs in some kind of way to don’t lose track where my tabs are. Therefore I need to open new chrome windows very often but I hate it to go to the Chrome icon right click > New Window. Isn’t is easier just to use Alfred? Yes there is a easy way to do that. Go to your Alfred setting and to the workflow tab and create a new workflow using the little plus icon which is located at the lower left corner. Choose Templates > Essentials > Keyword to AppleScript. Now click in your new workflow the keyword button and you see the preferences for that. 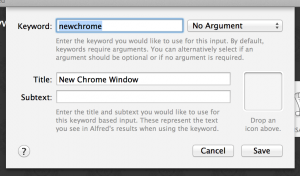 I chose newchrome as keyword but you can pick any keyword that fits best for you. 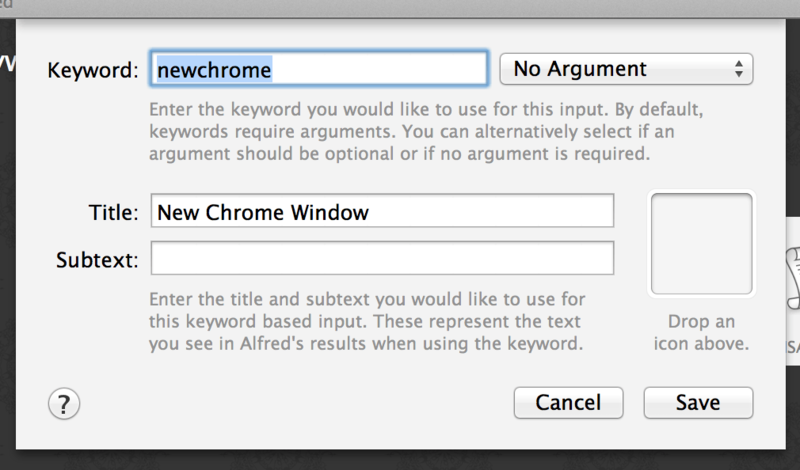 But make sure to select „No Argument“. Give it a nice title and subtext if you want and save it. Up to now nothing would happen if you call this workflow. Click now an the AppleScript button and enter the following code and save it. Now you’re ready to go. Type newchrome and a new chrome window will open. As to make it a little bit prettier I also use the chrome icon. For that go to your Applications folder right click the chrome app > Show Package Contents. The icon is located in Contents > Resources > app.icns. You can drag and drop it into the appropriated icon placeholder field (see second screenshot). Glad to hear. I use that multiple times a day. this seems to be opening two instances for me since osx upgrades along the way. thoughts? hmmm…seems if i recreate it and mark it as cache works fine now. awesome workflow!